Ten teams compete against each other in “faking,” a mix of theater, acrobatics, and illusion. This is the second season, featuring a team of magicians — Spidey, Joel Meyers, and Joseph Reohm, all of whom appeared on Wizard Wars. There are other magical effects used by teams throughout the series, including black art, wires, and video illusion. 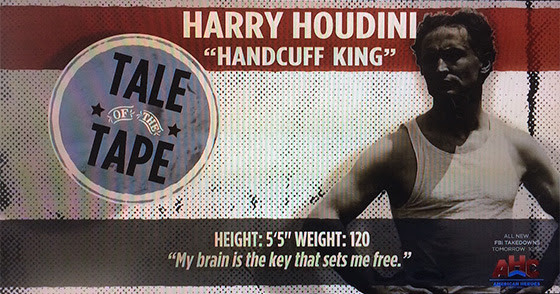 And if you didn’t catch it, Houdini was a recent “contestant” on America’s Most Badass on the American Heroes Channel. The show pits historical figures against one another for the title of Most Badass, with Harry going up against Neil Armstrong, Teddy Roosevelt, and John Dillinger. The episode, “Living on the Edge, is available to view for $1.99 on YouTube. Spoiler alert: Our boy doesn’t do so well. 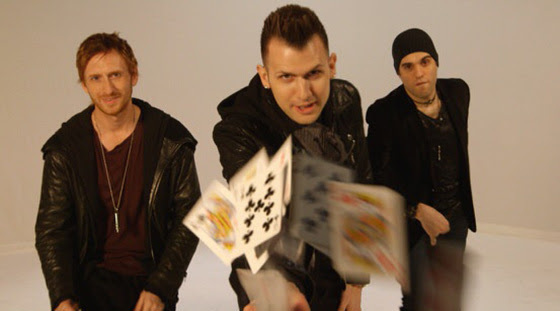 Darcy Oakes, a Canadian magician who followed up his fifth-place finish on Britain’s Got Talentwith a one-hour UK special in December 2014, is featured in this YouTube clip promoting Tim Horton’s fast-food restaurants. A 30-second version will reportedly begin airing across Canada this week.